September 1666. 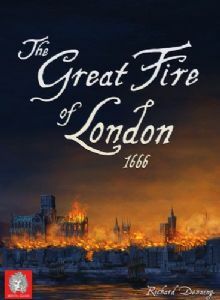 A careless baker in Pudding Lane forgot to put out his fire and it spread creating an inferno which would destroy 13,000 houses and make 70,000 of London’s 80,000 population homeless. The Lord Mayor fails to act and it is down to the trained bands of militia led by a few worthies to fight the fire and finally put it out. To do so they must decide which districts to demolish to protect others. These same individuals own much of London and making such choices is painful. In the end though it is an opportunity for many. Someone is going to come out of this with the most property intact and someone will be seen to do the most to fight the fire. Could that someone have enough influence and popularity to become the next Mayor? The players are men of wealth and standing who own property around London. They can use the trained bands to fight the fire, use demolitions to destroy blocks of housing to prevent the fire flowing or turn a blind eye and allow the fire to spread and damage rival’s property. Victory can belong to the player with the most property left but putting out fires can give you a boost. In addition each player will have several hidden objectives which might include helping another player or protecting parts of the city.